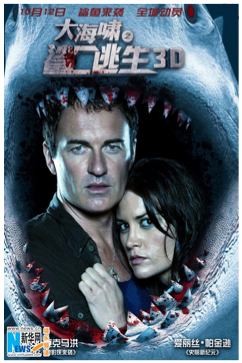 For only the 2nd time in history a foreign film—namely the Australian horror-thriller Bait 3D—has opened to bigger numbers in China than in North America. With its $8 million 3-day weekend China debut, Bait is running 30 percent ahead of its North American opening, and will likely run up a bigger final tally in China than the $15.3 million it has taken in stateside. The first time a foreign film achieved such a feat was this past Spring when Titanic 3D logged a massive debut and finished up with a $154 million final gross, nearly three times its U.S. total. The difference this time is that Bait is a new release with virtually zero pre-awareness. Bait has also set a new bar for horror releases this year, and depending on whether one considers Resident Evil 4 a horror film, Bait would qualify as either the biggest or second biggest debut ever for a horror flick in the PRC. With a director and cast you’ve probably never heard of, and with an outlandish plot that involves a group of shoppers who are trapped by a freak tsunami in a submerged grocery store amongst a bloodthirsty group of great white sharks, one could be forgiven for thinking Bait an unlikely hit. But it seems that Chinese audiences were attracted to Bait’s combination of 3D with action and gore just like, well, like sharks are attracted to blood in the water. Producer Gary Hamilton of Arclight Films was delighted with the picture’s performance and tells me he’s planning a sequel. Also noteworthy about this week’s box office chart is that it was the first time I can recall when the #1 and #2 films in China were both non-U.S. foreign films. Although foreign films took a 64 percent share of the weekly box office, U.S. films accounted for just 13 percent. This doesn’t bode well for Hollywood’s studios, most of which remain bizarrely under-invested and under-represented in what has long been the world’s fastest-growing movie market. All year I’ve been warning that unless the studios begin to meet the Chinese halfway they risk getting squeezed out of this mammoth territory, and with each passing week it’s looking increasingly likely that’s precisely what’s happening. Two other foreign entries, The Expatriate and The Cold Light of Day, didn’t fare nearly as well as the 3D fish tale, with both of the former films netting around $1 million or less. The next foreign debut in China is also a non-studio film, U.K.-based Working Title’s Anna Karenina, which opens today. It won’t be until the end of the month before another Hollywood studio film, The Bourne Legacy, makes an appearance in China. This entry was posted in Box Office Reports, Opinion and tagged Anna Karenina, Bait 3D, China box office, Gary Hamilton, resident Evil 4, Rob Cain, Robert Cain, The Bourne Legacy, The Cold Light of Day, The Expatriate, Titanic 3D, Working Title by chinafilmbiz. Bookmark the permalink. Rob, do you remember when Liam Neeson was made fun of — then he starred in ‘Rob Roy’ and carefully built his ‘stature’? It was interesting to see Taken2 did well in China – I saw both Taken movies and thought them well done. On location in Istanbul made the difference! Too much bad CGI in movies! Ann, yes, I don(t think many people thought Liam Neeson would become such a big office draw. But he knows how to play to his strengths and he’s been smart in his choices (mostly, anyway) and suddenly he’s one of the world’s biggest movie stars. To me, Taken 2 may be French on the paper but it is shot in English and with American actors… I consider Taken 2 half French half American at the minimum. I have to disagree with you on that Cyril. French writer, French director, French production company, French DP, French composer, French production designer, French editor, French financing, mostly non-American cast and crew– TAKEN 2 can’t be considered an American film at all, even if its language is English. Ok, maybe the “savoir-faire” (how-to) is French, but the movie is very American-like not French-like at all, the main actor is American and the language is English. I don’t see it as a French movie, to me a French movie is with French actors at least and shot in French at best. Like Asterix 4 that just released, that’s a typical French movie to me. According to CCTV news that I saw, BAIT is supposedly a Sino-Aussie co-production, in which case then it’s released in China outside the import quota and with revenue-sharing terms like those of domestic Chinese releases… Nice score for Arclight. I believe it’s actually a Singapore-Australia co-pro.